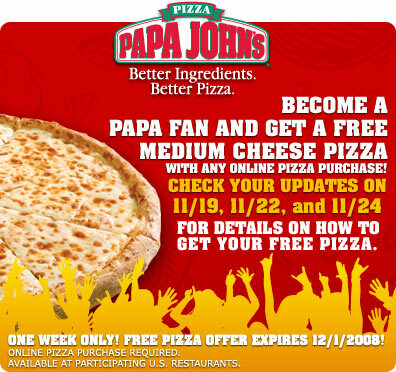 Papa John’s is looking for new friends on Facebook, and it is sending out a coupon code for a free medium pizza to anyone who becomes a fan of its group page. 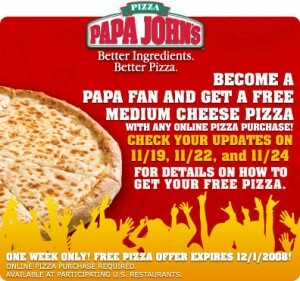 The deal will be sent out to the pizzerias’ friends through the group’s updates on the Facebook website this week. And, the free pizza special requires the purchase of another pizza. The deal ends on December 1st. Most of the large pizza chains are spreading their brands though the major social networking sites such as Facebook, allowing its customers to order pizzas over the internet and even text messaging, and also even more unconventional means. Last month, Pizza Hut began allowing customers to order pizzas using Facebook. The pricing wars between the heavy pizza hitters have only intensified lately, and pizza lovers everywhere have been reaping the rewards. For example, Pizza Hut gave free downloads to its online customers, and Domino’s just enabled ordering by TiVo.